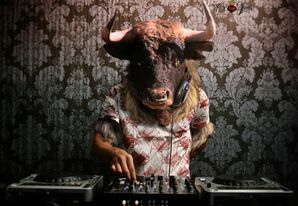 The Minotourist (Minotaurus viator) is a boss-monster. Once in a great while, a Minotaur goes on vacation. Favorite Minotourist touring spots include the Great Lava Desert of Trogh and Eastern Magmatic Plumules. Adventurous Minotourists enjoy mountain-climbing in the Jagged Peaks and World's Apex, or spelunking and dwarf-hunting in The Cavern of Dwarves' Glory. Minotourists looking for a chill time have been known to visit Last Resort, while those on a budget seek out the Balsamic Cheese Inn in Monsterdam. Minotourists love house music. They tend to be bad dancers, as they are top-heavy. Though they try to relax, Minotourists rarely succeed, and Heroes should not be fooled by the tropical shirts, ten-gallon hats worn to hide the deadly horns, cargo shorts full of traveler's checks and candy, or the cheap flip-flops. Minotourists are still Minotaurs at heart, and are especially prone to road rage. They will tear through the color red. This page was last edited on 21 February 2019, at 14:49.